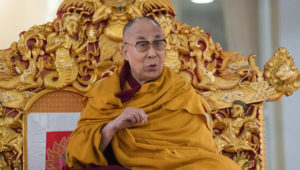 Bodhgaya, Bihar, India – This morning, His Holiness the Dalai Lama arrived at the Kalachakra Maidan, greeted the crowd and took his seat on the throne. While the ‘Heart Sutra’ was chanted in Chinese, he undertook preparations for a Sarasvati permission he had decided to give. He remarked that during the current series of teachings he has been giving here in Bodhgaya, people from several traditionally Buddhist countries had recited the ‘Heart Sutra’ at the beginning of teaching sessions in their respective styles and languages. He recalled that fifty years ago young Westerners began to travel to Asia in general and India in particular, where they took an interest in ancient Indian knowledge. Many of them became Buddhists. Consequently, today, the ‘Heart Sutra’ would also be recited in English. “Since religious traditions have, by and large, been of benefit to human beings, they are worthy of our respect,” His Holiness explained. “It’s very sad if religion becomes the basis of conflict and violence. Therefore, it’s good to work for harmony among our various traditions. In Tibet I knew very little about other traditions, but in India I met people like Thomas Merton, a deeply spiritual man, who opened my eyes to the potential of Christianity. Subsequently, I made friends with people belonging to other faiths and developed admiration for them. In Scotland, on the other hand, a dedicated monk told me that he would remain a Christian while his teacher still lived, but after that he wanted to practise as a Buddhist. “This reminds me of another story of a Tibetan woman in the 1960s who accepted support from missionaries to ensure her children went to school. She told me that to repay their kindness she would be a Christian in this life, but a Buddhist again in the next. Whether to adopt a religious practice is our own choice. It’s not something that can be imposed by force. Before resuming his reading of the ‘Diamond Cutter Sutra’, His Holiness announced that he would be giving a permission of Sarasvati, the female deity associated with wisdom, at the end. He read steadily through the text stopping here and there to comment. He remarked that the way to develop an understanding of emptiness is to listen to explanations of it, reflect on what you’ve heard and meditate on what you’ve understood. The sutra repeatedly makes the point that although phenomena are empty of inherent existence that isn’t to say that they don’t exist at all because they have a functional existence by way of designation. This is the Middle Way the point of view that avoids the two extremes of permanent existence and not existing at all. 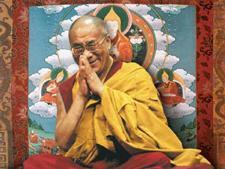 His Holiness suggested that the Buddha’s statement in the penultimate verse is capable of vast interpretation. Once again it alludes to the ultimate reality of things in the context of their nominal existence, their existing by way of designation—space-like emptiness and the illusory nature of things. In what spirit is this explanation given? just according to things as they are, without agitation. His Holiness recommended that the Chinese devotees introduce the recitation and study of Nagarjuna’s ‘Fundamental Wisdom of the Middle Way’ and ‘Ornament for Clear Realization’ in their monasteries and temples. But, he added, this should not be restricted to monastics, lay-people should participate too.